:) Tried to replicate the Spring Princess make up look done by Michelle Phan and really, you no need expensive makeup products to achieve this look! BEST of all, achieve this makeup look for JUST $20 (or $29 if you have extra cash to spare)! PRIME your eyes!!! It is necessary to prime your eyes with eye primer so that the colours will be more vibrant and lasting (meaning it won't crease and smudge throughout the entire day). I'm using Urban Decay Primer Potion. But of course, you can get other eye primers as well. Apply A shade (either Red Bronze or Cherry) lightly on your entire lower eyelid. Surprisingly, NYX product are very pigmented and the colour are very vibrant as well! Apply B (purplish-pink) on your Outer-V of your eyes. Not sure what I'm talking about? 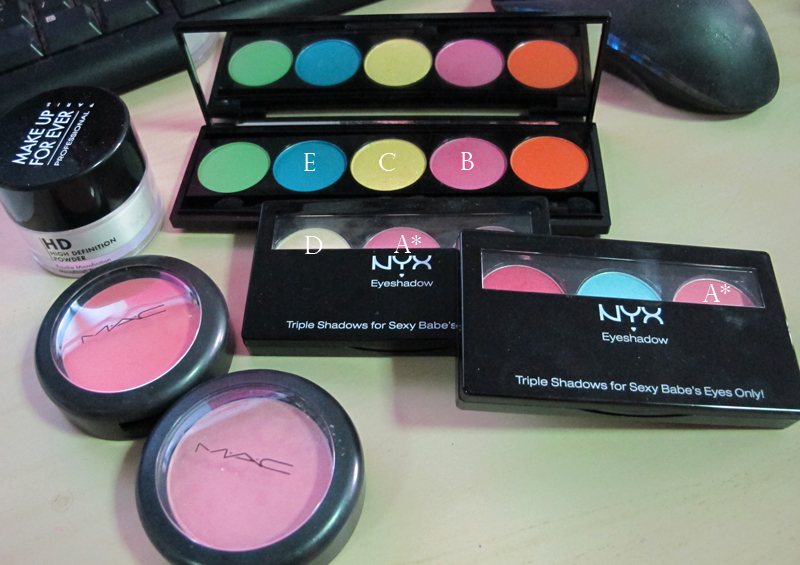 No worries, I have link Michelle Phan's video at the end of the entry for your easy preference! Apply C (yellow) on your tear ducts to make your eyes sparkle and bigger looking too! Apply D (shimmery or frosted yellow) on the center of your eye lids to create highlight for your eyes! Apply E (Turquoise) gently on your Lower lash and swipe gently toward your tear duct to create a softer line. I'm using MAC 219. In any case, you can use any other pencil brush. Many have been asking me via email on where do I get such safe, good & inexpensive makeup products and I'm pleased to share with you guys that I bought them at SMOOCHIEZZ!!! :) Guess some of you guys are already familiar with this local company and lemme share on how I came across this website and became their 101% loyal customers! GOODBYE to some drug-store brands which have failed on the colour pigmentation!!! HELLOOOOO NYX! As I had mentioned in my previous entries, I was a crazy fan of makeup and I have been watching (and re-watching) some of the Makeup Gurus such as Michelle Phan, Miss Chievous and Promise Phan and have been wondering if some of their inexpensive makeup products are available at our Sunny island. Not to make my IT knowledge back to the drain *LOL*, I googled with lots of weird searching words like 'NYX in Singapore. Where to find NYX' etc. FINALLY, some forum (I think is Flowerpod) has mention SMOOCHIEZZ and I'm sold! LOL! They got TONNES of NYX makeup that is not available elsewhere and it is really very AFFORDABLE!!! They even have ELF (another popular drug store makeup products in the US), Coastal Scents, OPI, Orly and MANY MORE!!! I will be heading down to their Showcase soon and will be snapping their place & products (with their permission of coz!) for you guys to see! MORE IMPORTANTLY - MENTION YOU ARE MY READER (SHUHUI) and DISCOUNTS WILL BE GIVEN ON THE SPOT!!! It's really cheap getting CHEAPER! :) Hope this is really a good deal for ALL of you and happy shopping over there! PS: Yes, you might see me hanging around there soon for some AWESOME DEALS! HAHA! As promised, please watch Michelle Phan's step-by-step makeup moves and have fun! 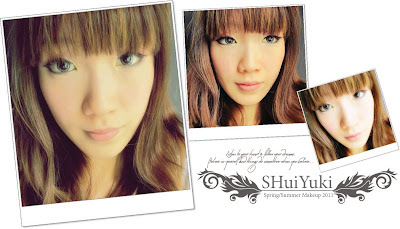 Top 10 Finalist for SPH-OMY Blogger Award 2011!